DOB: 4/29/12 (Quad) Height: 19 3/4"
She's just a quiet, easy-going sweetheart. And---as you can see---a LOVELY doe. When we bought her dam, Vicki told me she had retained a truly wonderful daughter. Yep!!!! She was 100% right. Sweet, beautiful...and an absolute dream to milk. 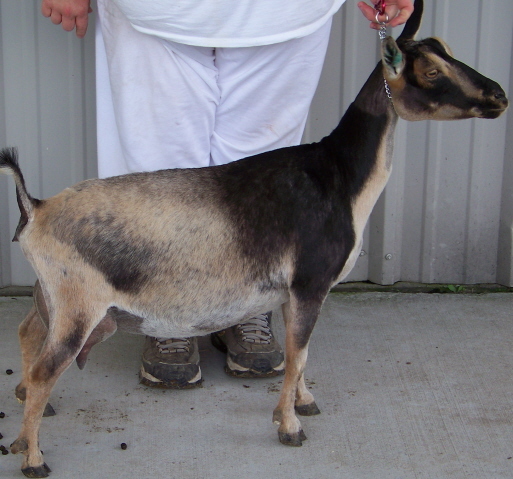 This doe's pedigree looks like the Whose Who of Lost Valley, one of my most favorite Breeders. Cache's dam, Dipp'n Dots, is Finished in all 3 registries, LA'd w 90, has produced the Nat'l JrRsv CH for NDGA, and whose son (Hyssop Dip) just LA'd w EEV90. His litter sister, Serendipity classified w E90.6 last Spring and topped 1000# on her 305 Day Test, ranking her in AGS Nat'l Top 10. Sera's udder scores were 90 and above. Same with Style, Breed Character, Body Capacity and Dairyness. Tragically, we lost Casche the day after she kidded 4/18 due to a severe dystocia that required an emergency trip to the Vet. She was a lovely doe and in my opinion, one of Dot's prettiest daughters (along w Serendipity, of course). Some things are meant to be a mystery and Casche's way-too-soon departure is one of them. She's in Heaven--a part of Sam's herd--and I reluctantly rest in that joy. Casche's sire, Daxus, is the sire of MCH/GCH LV DAX Legend +B +*S, who has sired multiple Finished CHs The dam of Daxus is ARMCH/GCH Lost Valley Callisto 2*M 2*DE(91.0), 2008 AGS Nat'l Champion Doe & 2010 Rsv Nat'l CH (at age 10!!!). Callisto has produced 3 Finished CHs (who have all produced Finished CHs) as well as LV Casting Crowns +*B+*S, whose daughters not only are Finished, with LOVELY udders---including MCH/GCH LV Tatiana *M 4*D, 2012 Nat'l JrCH.